There’s a series of children’s books called Dinosaur Cove which features a pair of young lads who discover a secret cave in their hometown leading to a secret world of prehistoric monsters and beasts. As well as being rip-roaring stuff for children of all ages, the books also feature some great illustrations. 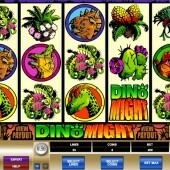 It’s this style that dominates online casino slot developer Microgaming’s prehistoric-themed slot, Dino Might, a 5 reel, 25 pay-line slot firmly based in the Jurassic period. Ok, so at first glance this slot does not appear to have the financial backing of a Steven Spielberg-led project but there is still plenty to offer slots fans despite the graphics and sounds not exactly being ground-breaking. On the reels are plenty of dino stars, like T-Rex, Triceratops and the Ankylosaurus, plus six different varieties of prehistoric plants. Over the top plays a nice, atmospheric sound FX of birds and insects. Check out the game's logo icon, as it acts as the Wild and substitutes for all regular symbols other than the Bonus and Scatter. The Wild doubles all winning combo amounts. The fossilized insect Amber symbol - looking like it’s come straight out of Jurassic Park - is the Scatter. Three or more of these on the reels triggers the Match Bonus round. Like a game of 'Doubles', you pick symbols from a grid until you match four of the same symbols. Do that and you'll bag a 20,000-coin jackpot. Find a multiplier and you can make that total rise even higher. Hit three or more Triggersaurus symbols anywhere and you'll trigger a straightforward Click Me Bonus. Hit three Scatters and you'll get to click on three symbols to reveal cash prizes; get four Scatters and you'll click on four, and so on. 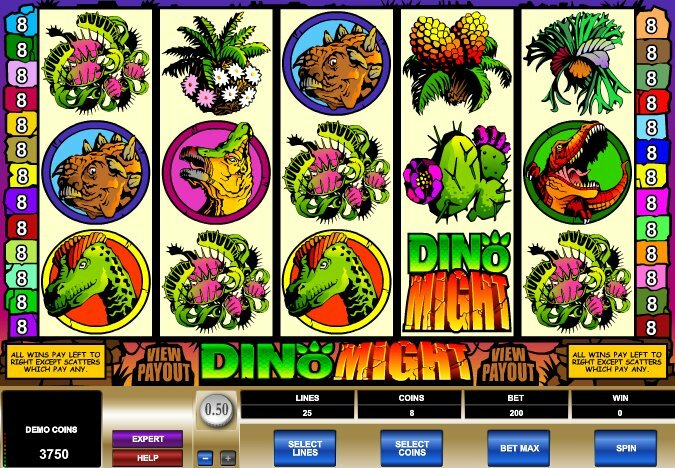 With a potential 80,000-coin jackpot up for grabs, Dino Might offers enough prehistoric thrills for the jaded dino-obsessed slots fan. There are plenty of other dinosaur-themed alternatives out there, of course, and with some hunting you can bag yourself a great game. Check out RTG's T-Rex slot - with a progressive jackpot it appeals to the big bettors, but for lots of low-end wins you might want to stick to other games. For me give me RandomLogic's monster-mash slot, Dawn of the Dinosaurs any day of the week. With cracking graphics, some nice jackpots, and a great dino fight bonus round, it wins claws-down.